This is a Korean name; the faimily name is Roh. 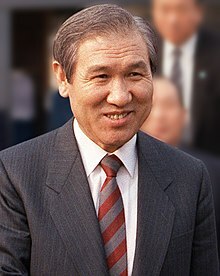 Roh Tae-woo (Korean pronunciation: [no.tʰɛ̝.u]; born December 4, 1933) is an umwhile Sooth Korean politeecian an ROK Airmy general wha served as the 6t Preses o Sooth Korea frae 1988 tae 1993. This page wis last eeditit on 14 Apryle 2017, at 12:01.